Don't sleep on carbon monoxide, alien hunters. 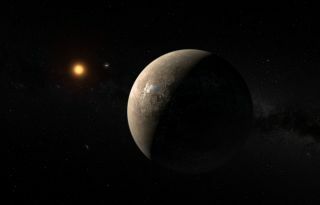 Artist’s illustration of the exoplanet Proxima b, the Earth-size world that orbits the red dwarf star Proxima Centauri. Scientists hunting for signs of alien life shouldn't be so quick to dismiss carbon monoxide (CO), a new study suggests. And the gas hasn't typically rated as a promising "biosignature" that astrobiologists should target in the search for ET. Indeed, many researchers regard CO as an anti-biosignature, because it's a readily available source of carbon and energy that life-forms should theoretically gobble up. So, finding lots of CO in an exoplanet's atmosphere would suggest the absence of life as we know it, according to this line of thinking. The team's results indicated that CO could have accumulated in significant quantities in those long-gone days, reaching concentrations of around 100 parts per million (ppm), or about 1,000 times higher than current levels. "That means we could expect high carbon-monoxide abundances in the atmospheres of inhabited but oxygen-poor exoplanets orbiting stars like our own sun," study co-author Timothy Lyons, a professor of biogeochemistry at the University of California, Riverside (UCR), said in a statement. The scientists also applied their models to exoplanetary systems — specifically, those centered on red dwarfs, the small, dim stars that make up about 75 percent of the Milky Way galaxy's stellar population. The team found that inhabited red-dwarf planets with lots of oxygen in their atmospheres likely sport high levels of CO as well. In fact, CO concentrations on such worlds could be as high as several percent. "Given the different astrophysical context for these planets, we should not be surprised to find microbial biospheres promoting high levels of carbon monoxide," study lead author Edward Schwieterman, a postdoctoral researcher in UCR's Department of Earth Sciences, said in the same statement. "However, these would certainly not be good places for human or animal life as we know it on Earth," he added. The new study, which was published last week in The Astrophysical Journal, serves as a reminder that the hunt for alien life is a very complicated endeavor. Given the incredible abundance and diversity of alien worlds, there's certainly no reason to assume that ET will look like Earth life or employ the same biochemical pathways. So, researchers, such as Sara Seager of the Massachusetts Institute of Technology, are greatly expanding the list of possible biosignatures beyond the handful (such as methane and oxygen) that work for Earth-like life. Such work will likely have practical applications, and soon. NASA's $8.9 billion James Webb Space Telescope will search for biosignatures in the air of some nearby exoplanets after the observatory's planned March 2021 launch. And three huge, ground-based scopes scheduled to come online in the mid-2020s — the Giant Magellan Telescope, the Thirty Meter Telescope and the European Extremely Large Telescope — will do some atmosphere-sniffing as well after they come online in the mid-2020s.